Fun And Games In The Secret Garden. Great big smiles. 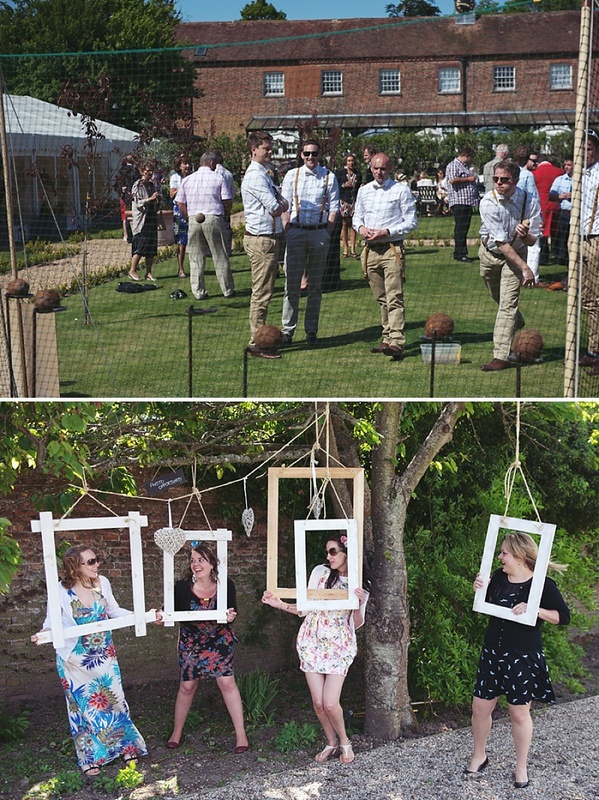 If there’s one thing that really stands out from Sally and Simon’s wedding then that’s it. Their day is just full of happy smiley faces. 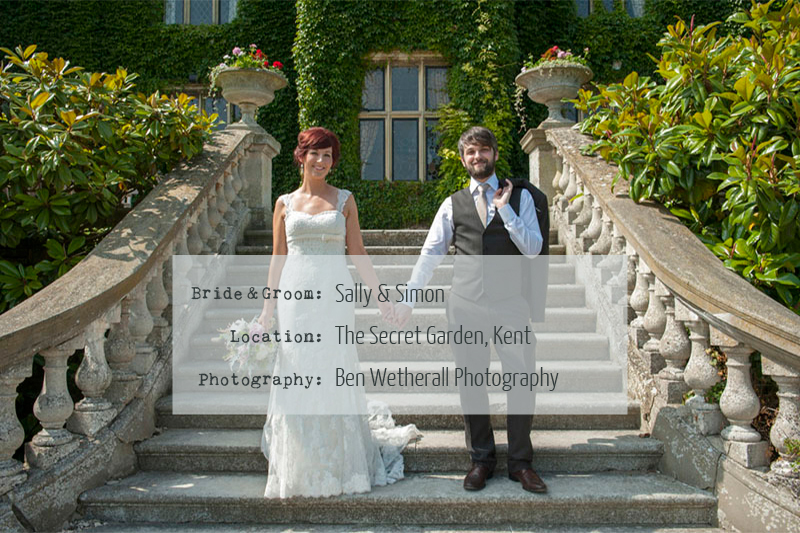 I suppose with a theme of fun and games, there was only really one way their wedding was going to go and The Secret Garden in Kent looks like the perfect place to host such a occasion. 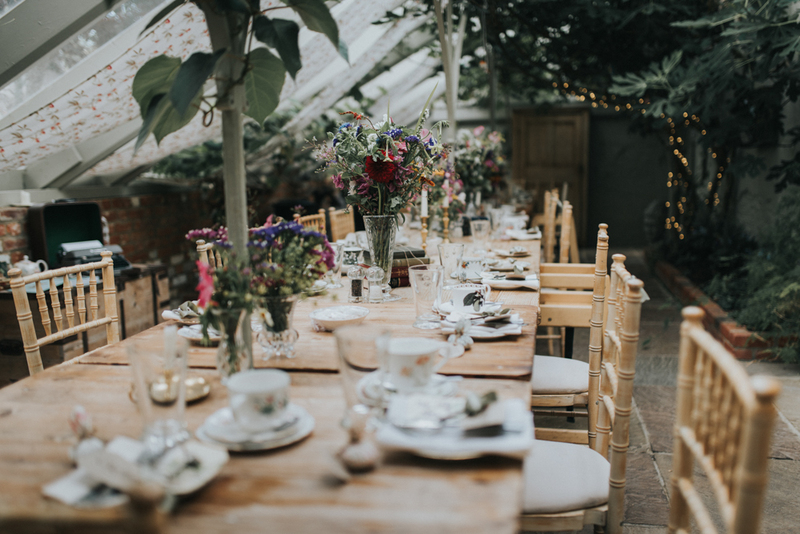 A private space with gorgeous gardens, pretty brick walls, a glass house AND the food sourced from Stephanie the Wedding Co-ordinators husband’s farm?!? I can completely see why Sally and Simon fell in love with the place. 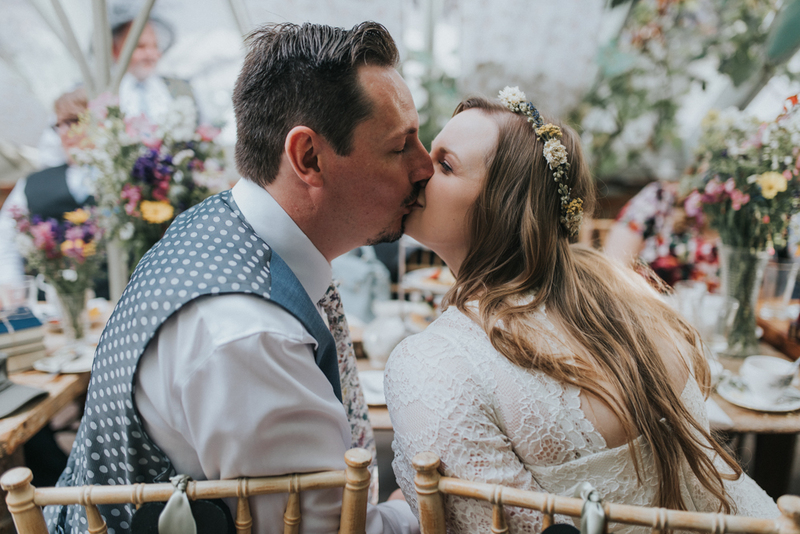 The lovely pair have used an awesome selection of vintage items to decorate their marquee too – I’m particularly loving the vintage dress patterns. Enjoy Sally and Simon’s big day lovelies, hopefully it’ll bring a smile to your Monday morning faces! 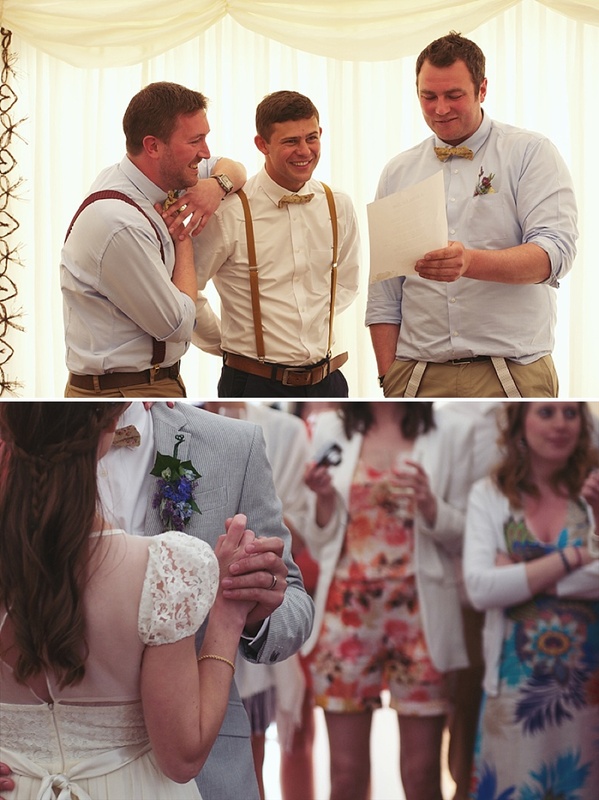 We do love a Groom in shorts, and lovely Dan is no exception. 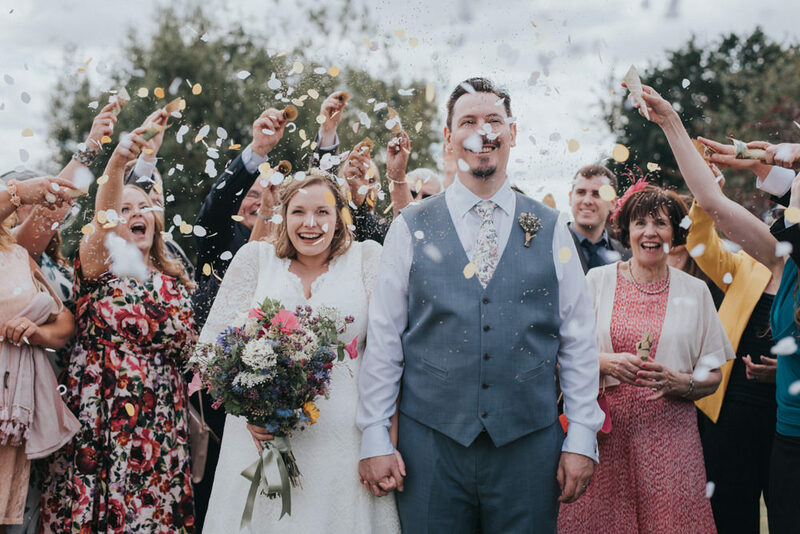 Add to the mix the gorgeous Zoe in her unusual Tatyana Merenyuk gown, heaps of delicious wild flowers, some watercolour Bridesmaids dresses AND Groomsmen in bowties and braces and you’ve pretty much got wedding perfection. Zoe and Dan also managed to bag the most epic wedding entertainment I’ve heard for a while – but I’ll let Zoe surprise you with that one. If the knees leave you in the mood for a little more men-in-shorts action and you missed these Bermudan beauts, make sure you check them out. We got married at The Secret Garden Restaurant, Mersham-Le-Hatch near Ashford in Kent. We knew they had a good reputation for food, and when we went to see them we loved the walled garden with a gazebo in the middle of rows of vegetables. 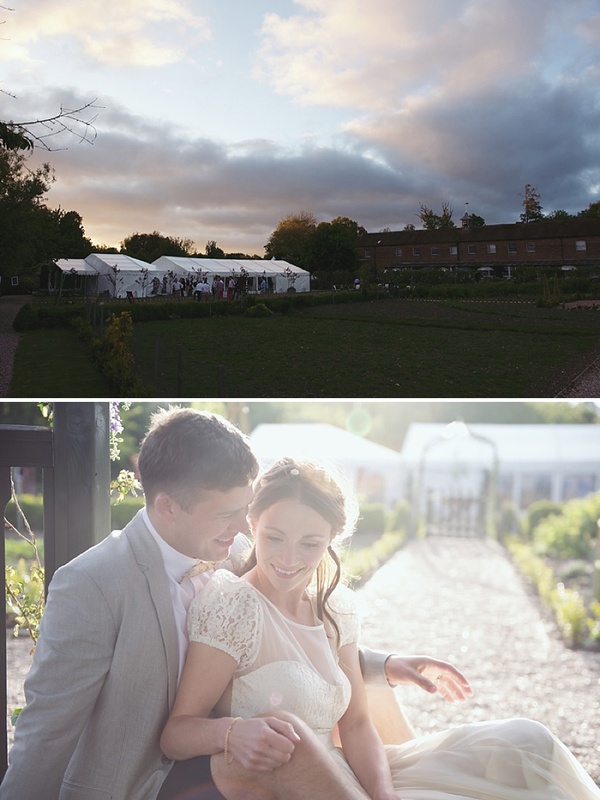 We also liked the fact we could have the ceremony and reception all in one place (the reception was in a marquee in the garden). 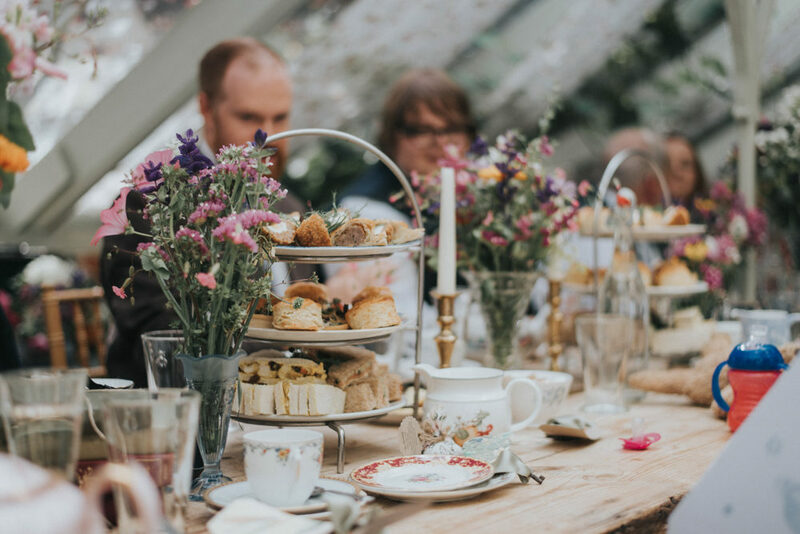 We knew it was the right kind of setting for us – naturally beautiful, outdoors, ever so slightly quirky… Even though we visited for the first time in winter when the trees were bare we both somehow were able to envision ourselves and our wedding there. That was what swung it I suppose, that feeling. We were going for an outdoorsy, informal feel so I wanted to keep my look quite natural. For my hair I got inspiration from Pinterest, I knew I was going to do it myself and just accessorised with little fake flowers bought on the high street. I had a trial with a make-up artist but the ‘flawless base’ and dramatic eye make-up just didn’t go with our ‘garden party’ style. I did it myself in the end with my normal make-up kit plus some corner lashes and a primer which I don’t normally use. My mum described my look as ‘very midsummer night’s dream’! 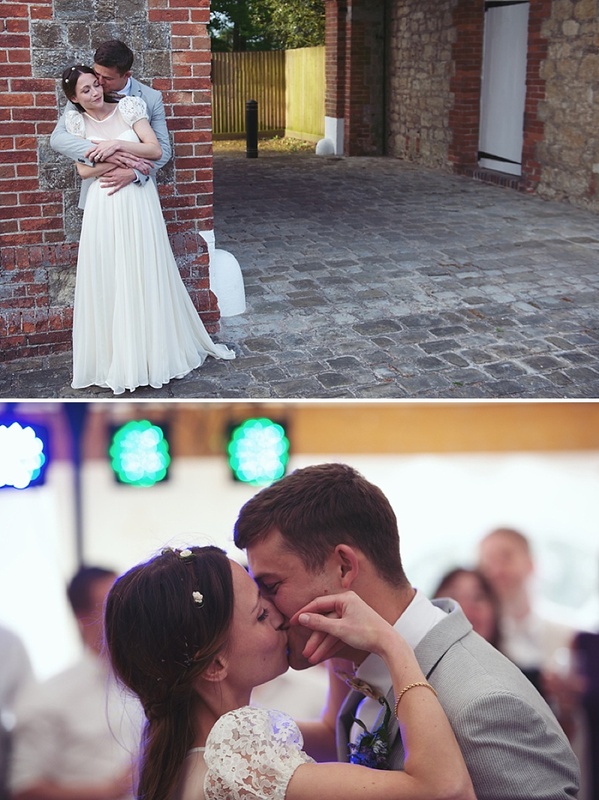 My dress was by New York designer Tatyana Merenyuk and I found it in Frou Frou Bridal Boutique, Tunbridge Wells, Kent. It’s a small store and the owners are two lovely, young, down to earth ladies who really seem to care. I thought I might struggle to find what I wanted – something unconventional but not ‘trendy’, not too heavy or structured. None of the dresses in the main collection were quite right but then they dug out this one-off sample that was different to anything I’d seen anywhere. When I saw my sister’s face I could tell it was the one. In terms of shoes and jewellery again I didn’t feel the need to go for expensive or glitzy additions, partly it’s just not style and partly the dress was so lovely by itself it hardly needed accessorising at all. My parents wanted to contribute to the outfit so they gave me a delicate gold bracelet which was the only jewellery I wore. Shoes I ordered a few pairs online and in the end went with a super-comfy pair from Zalando (think they were by Vagabond). 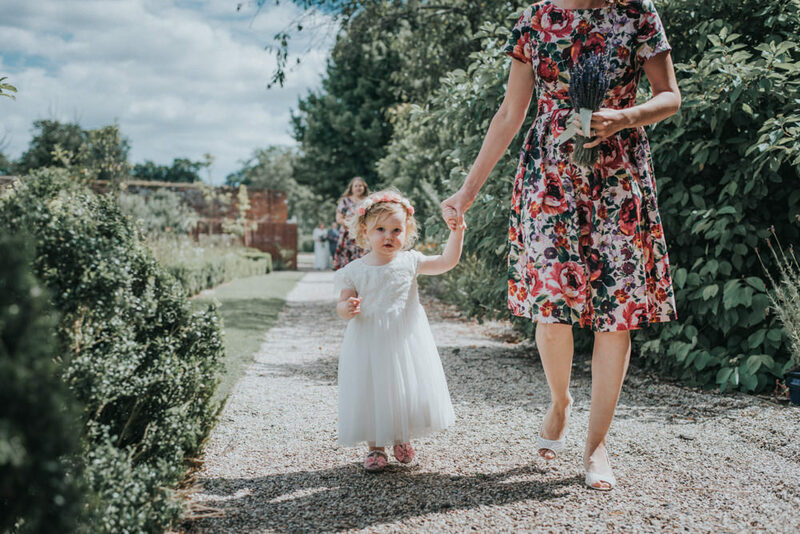 I’ve never been a fan of matchy-matchy clothes or colour schemes so we had long talks about how to get round this but still have a cohesive bridal party that looked a bit special and stood out from other guests. Luckily Dan feels the same way and we found some cool ideas on Pinterest for informal groomsmen’s outfits. They all wore beige trousers, brown braces and white shirts with gorgeous handmade bow ties and pocket squares from Bow & Tie London. Bridesmaid’s dresses ended up being a floral Traffic People number I’d ordered from ASOS – again I’m not a fan of the conventional style for bridesmaids so just went with something summery and floaty to match our theme. My sister’s loved the fact they were comfortable too! There was no real colour scheme – in the end there was quite a bit of blue I suppose, but I made sure nothing was too ‘matching’! 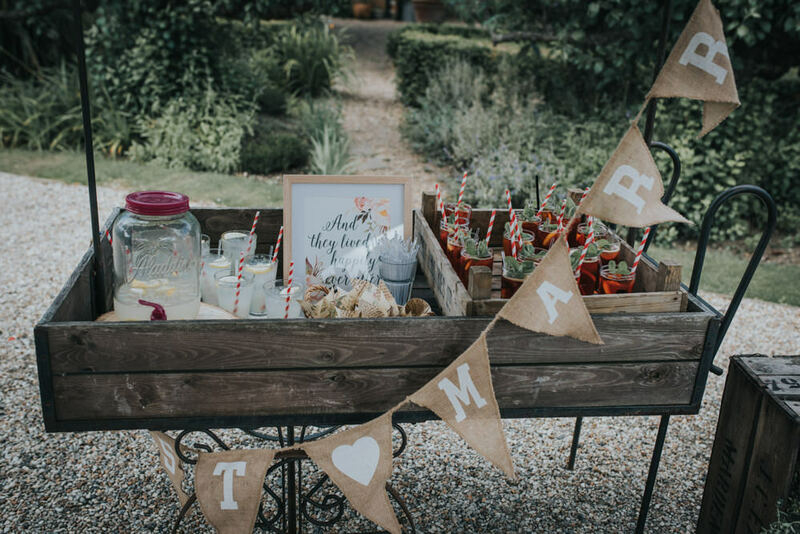 The theme was ‘garden party’ and we had bits and pieces of vintagey and rustic looking decorations – some supplied by the venue and some we found or made ourselves. My mum made us a post-box in the shape of an Oast House (because we live in one) and groomsman Neil handmade giant photo-frames to hang from a tree. All the flowers were done by the talented Fiona Chapman of Anenome Blue. Her lovely shop is on the same site as the venue and they have a partnership whereby table centre flowers are included in some of the packages so it made sense to have her do the other bits too. 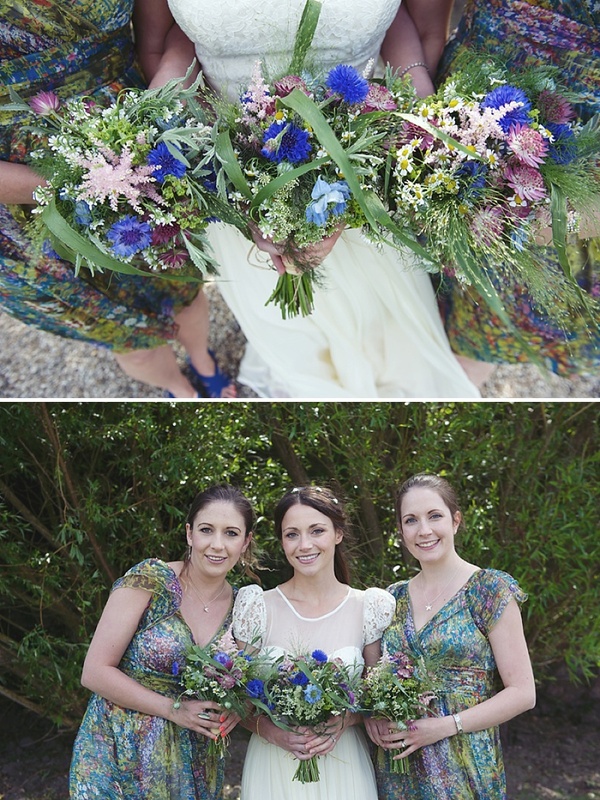 Fiona did an amazing job of bringing my vague idea of ‘wild, mixed flowers’ to life and we ended up with gorgeous natural looking, multi-coloured, hand-tied bouquets for me and my two bridesmaids. 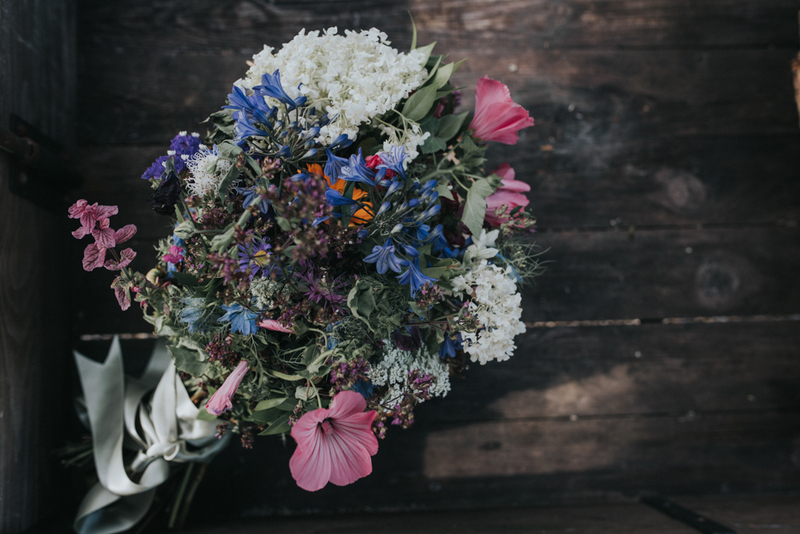 We also had the gazebo decorated, button holes with cornflowers and herbs for the boys and a colourful mix similar to the bouquets for the table centres. Ours was a civil ceremony so we added two readings to make it more personal and to make it last a bit longer! One was ‘How Falling in Love is like Owning a Dog’ by Taylor Mali which Dan’s sister read, and one of my best friends Laura read ‘I Love You’ by Larry S. Chengges. We also had a member of the evening band do an acoustic rendition of ‘I Wanna Grow Old With You’ from the film The Wedding Singer as I walked down the aisle – I love that song. 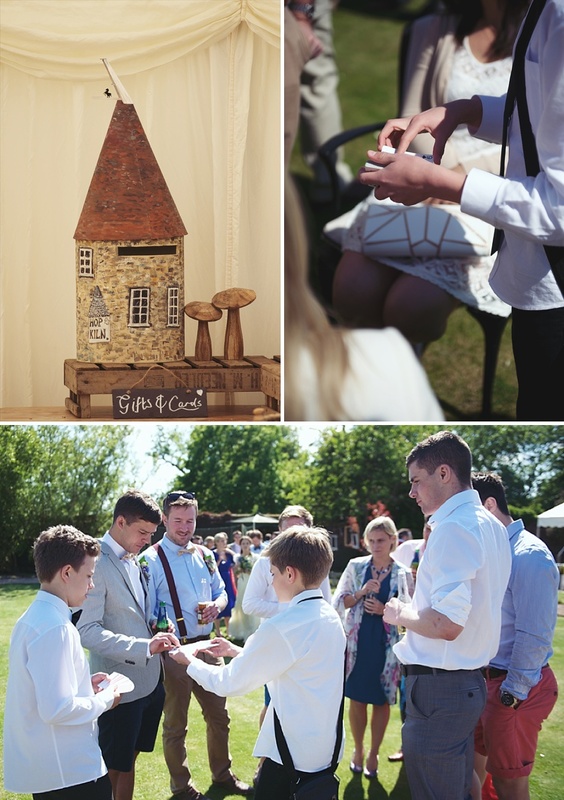 In between the ceremony and meal we had a surprise for guests in the form of two teenage magicians who I knew through friends – they mingled with guests in the garden performing card tricks and were truly impressive – everybody was stunned by the pint-sized talent! We had an amazing band with us all day called The Brightside Band. 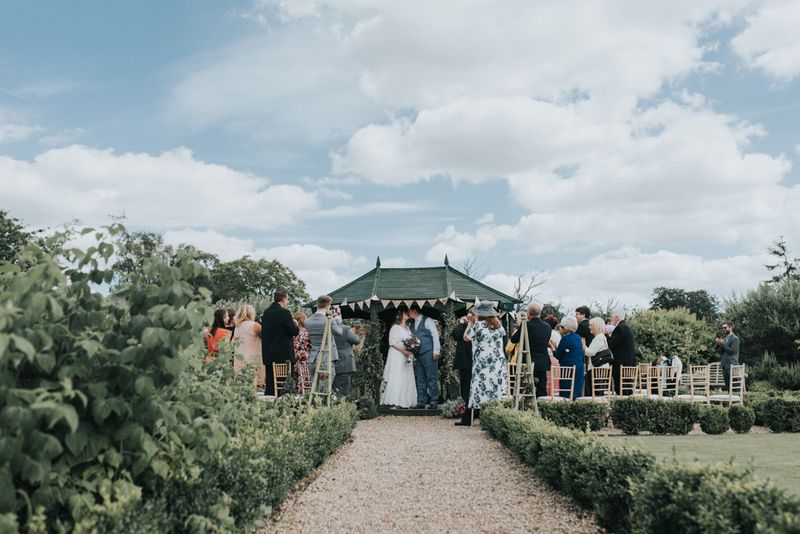 I can’t recommend them enough – they learnt new songs for us, lent their equipment to the surprise act we had coming on after them, and doubled up as a gorgeous ‘chill out’ jazz trio in between the ceremony and meal which everybody loved. They did a stripped back version of Beyoncé’s ‘Halo’ for our first dance which I absolutely loved – it was awesome to have one of my favourite songs sung live. Our delicious food was done by the venue since they are a restaurant (one of our reasons for choosing them!) we knew it would be good, and had great comments from our guests. Guests had a choice of three starters, four mains and three desserts which we had selected from an even larger list so we were happy we could tailor it to our tastes. Cakes were three sponges (carrot cake, chocolate orange and lemon drizzle) and a tray of brownies, made by a lady called Debra who has a stall at a local farmer’s market. 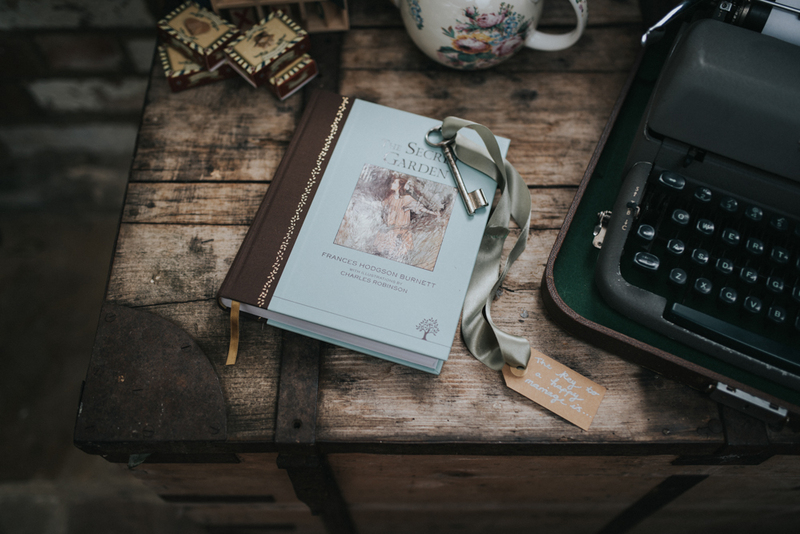 To be honest stationery wasn’t that important to us, we got brown cardboard invites, thank you cards and tags for our message tree from Paperchase that went with our rustic / country style décor. We made invites, wrote place cards etc ourselves as we weren’t worried about them being fancy or perfect – not our style! 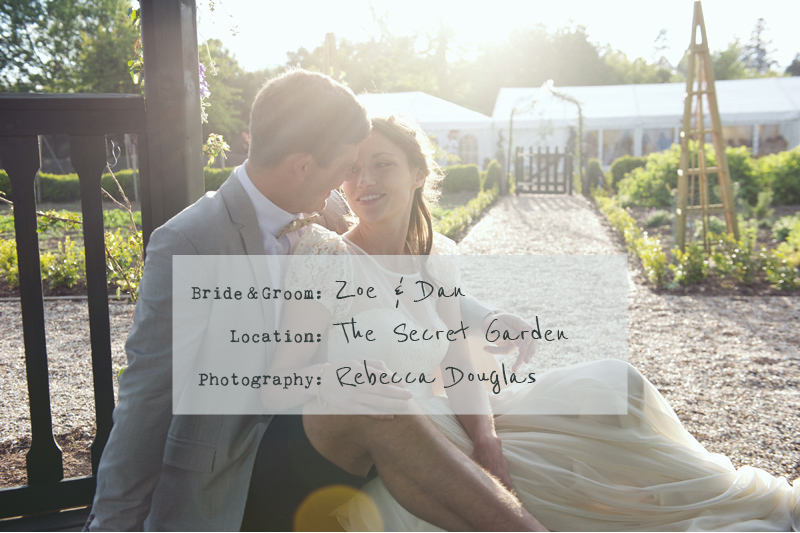 The table plan and names were themed around Dan’s other Love – the footballer Dean Saunders. We had eleven tables so it worked really well – tables were represented by footy shirts and stuck on to a foosball table background! 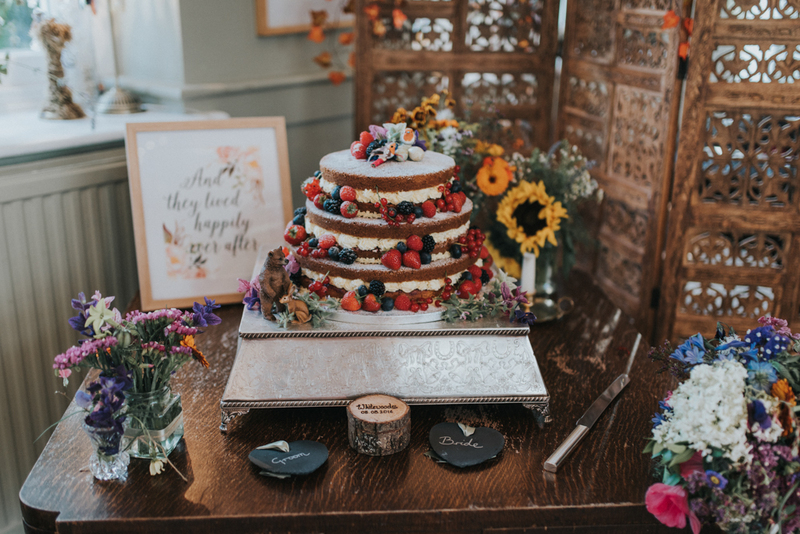 I want to say a big THANK YOU to our venue for accommodating all our wishes and also our lovely photographer Rebecca Douglas, who has been so wonderful throughout we really can’t recommend her enough. It’s been said many times, but I can’t stress enough how important it is to be true to your own style, personalities and tastes – go with gut feelings when making choices and don’t let other people or what ‘should’ be done sway you. 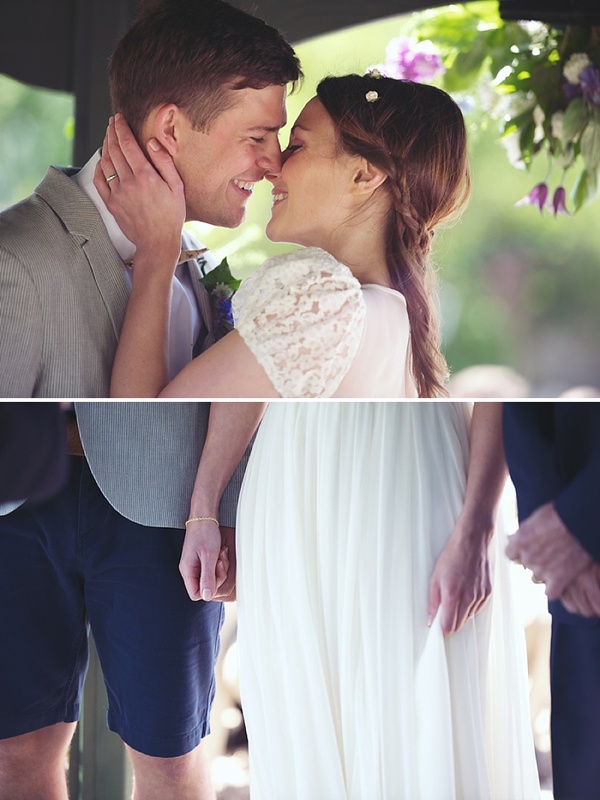 There are no ‘rules’ apart from the legal bit in the ceremony – you really can do it your way. I almost forgot, I haven’t revealed who our surprise act was – the biggest talking point amongst guests for days! Dan, through a university friend, managed to book the Artful Dodger for a set after the band! They smashed it – the dance floor went crazy – all our friends were loving the 90’s garage tunes, reminding us of some of our first nights out as teenagers with such classics as ‘Re-Rewind’ and ‘With A Little Bit Of Luck’. It was surreal and SO much fun! And how awesome that ACTUAL Artful Dodger DJed! 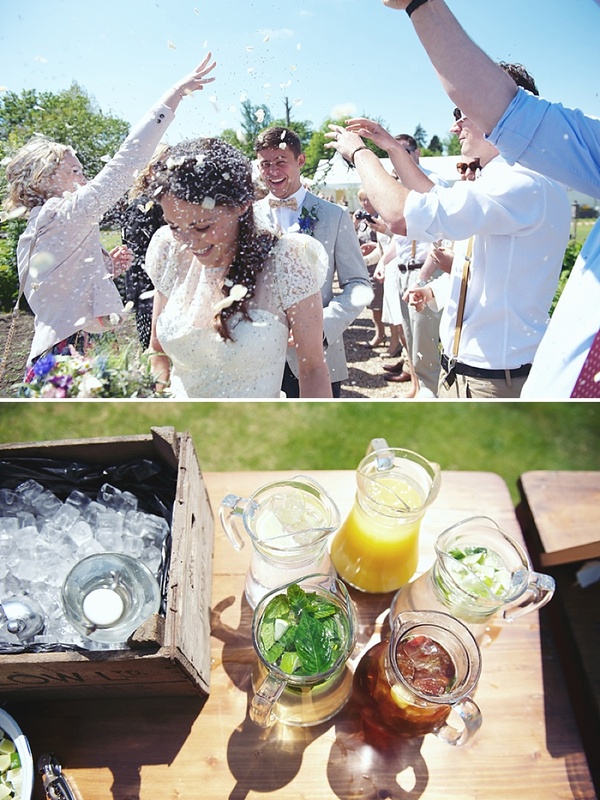 Yay for ‘no rules!’ Rebellious weddings are always the best.